the route of pipes for water and sewage. his home village in Gloucestershire. The main barrier faced by potential healers is lack of confidence. In other words you have to act from compassion, and you have to put yourself forward. All else is technique, learning, and experience. Peter Golding embodies all these qualities. A very highly experienced dowser, for many years he has served the community through his work at Slimbridge Dowsers, and as a dowser and healer. This long experience provides the background for his new book Dowsing for Health and Spiritual Healing, and his excellent other publications (Experiences of an Old Dowser, and, Dowsing for Water: The Complete Practical Guide). 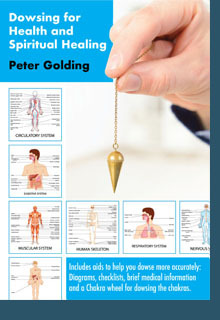 Peter’s book provides a straightforward approach to Dowsing and Healing, and also a guide to the major body systems. It will enable anyone who already has the basic dowsing skill to start healing. It provides an excellent overview, and includes diagrams, charts and other information to enable you to dowse more accurately. There is no longer a good excuse for you not to provide healing through dowsing. I urge you to use this book and take your first steps on this journey. The book is available direct from Peter Golding for £7 plus £1 postage. Telephone 01453 890316 or write to Little Kingston, Moorend Lane, Slimbridge, Glos GL2 7DG. With colour photographs and original diagrams by artist Helen Gee. "This book fills a huge gap. There are many introductory books on learning to dowse, and some outstanding books by advanced practitioners, but very little on how you make the enormous transition from enthusiastic amateur dowser to accomplished water diviner. The publication of this book is therefore to be celebrated." is a long awaited memoir of respected water dowser and diviner, Peter Golding. Peter explores the mystery of dowsing in its many forms from water divining to remote healing. He shares his fascinating experiences, but most importantly, he shares the techniques he has learned and honed over 34 years. If you want to be inspired, encouraged and affirmed in your beliefs as a dowser, this is the book for you.